If you’re thinking of renovating your home for the New Year, a sliding wardrobe can be a fresh addition to your bedroom. They not only bring a touch of elegance and structure, they also maximise the space that you have. To convince you further, here are some reasons why you need to invest in sliding wardrobe doors. Some people think that you need to have a large space when installing sliding wardrobes. However, it is not actually necessary. Sliding wardrobes can fit even in small, compact areas and allows you to increase your storage space by providing layers of shelves and compartments. Unlike wardrobes with doors that open outwards, sliding wardrobes doors slide side to side, overlapping each other so they can save you more space. Bespoke sliding wardrobe doors come in a variety of designs and colours, so aside from being a storage space, it can also be a room decoration. Wardrobes with coloured panels give your room a contemporary appearance whilst a mirrored-design can be used to check your reflection and create an illusion of a bigger, airier space. Sliding wardrobe doors are sleek and stylish that is why they are preferred by most homeowners. You can choose from a wide range of frames and panels that will fit the theme of your home. Timber doors have a more traditional look whilst aluminium frames give off a contemporary feel. As compared to conventional wardrobes, sliding wardrobes can be fitted from floor to ceiling and gives you an opportunity to customise your storage depending on your needs. You can have a hanging rod and shelves for your clothes, racks for your shoes and additional compartments for your other items. You can also install another set of doors inside your wardrobe to keep your valuables out of sight. 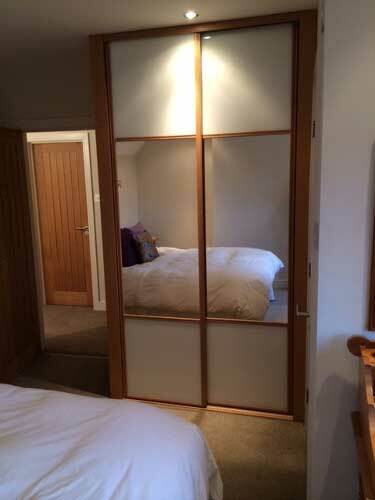 Installing sliding wardrobe doors to you bedroom can boost the value of your home. High quality wardrobes add a touch of luxury and glamour to your space. This will surely be noticed by your potential buyers once you decide to sell your property. For elegant, space-saving solution for your home, Superglide Wardrobes are the only call you need to make. We have 20 years of experience in the bespoke sliding wardrobe door industry. We create made-to-measure wardrobes that are specific to your requirements. Please feel free to get in touch with us on 01793 861584 or email us at sales@superglidewardrobes.co.uk.